As your business grows, it isn’t uncommon that additional office space becomes a necessity. Companies who have undeveloped floor space can easily add modular offices to expand functional workspaces in their buildings. The most useful application for modular inplant offices is in warehouses. 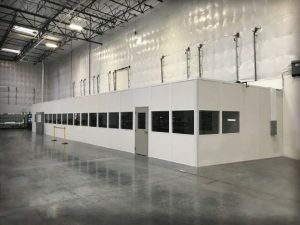 Since the modular office wall systems can get relocated or expanded, they can turn underutilized spaces into productive space, and then be moved to a new area in the warehouse as your business changes. This ensures that you are maximizing your return on investment. Warehouses used as fulfillment centers and other commercial uses are typically wide open spaces, while offices are cut up with many different walls. The use of prefabricated enclosures and modular offices is a logical solution for dividing a portion of this wide open area into private office spaces that make the building more functional. This allows for one space to serve both functions. Our prefabricated offices have a variety of options available, including the size, type of flooring, color, and style, allowing you to get a customized modular office configuration that is perfect for your work environment. Prefabricated offices are also useful in Manufacturing and Industrial applications. They are a cost-effective way to add private and quiet offices for administrative, managerial, or supervisors to handle their business duties. The customizable options make it easy to construct offices that suit your taste, budget, and individual requirements. Modular prefabricated offices assemble quickly. In most cases there is little to no disturbance to your normal business operations during the assembly. Prefabricated offices can get used for a variety of specific purposes. If you need to add an office or other types of workspace to your premises, here are a few of the most popular prefabricated offices for industrial and manufacturing use. Administrative Offices – Administrative prefabricated offices are practical for adding private workspaces for employees. They are a flexible solution because the walls are easily reconfigured, insulated, and can get moved, unlike permanent walls with limitations. Supervisor Offices – Provide your supervisors with private offices to complete their managerial and supervisory roles while still being close to and within eyesight of their employees. In-Plant Offices – In-plant offices can get used for front offices, human resources, or nurse stations. By housing these offices within your workspace, you make it more convenient for employees to communicate with administrative staff when needed. Receiving and Shipping Offices – Shipping and receiving offices help your staff members conduct business safely and more efficiently. Shipping offices offer cover from direct heat and cold air that flows in from receiving docks, while keeping them safe from the moving machinery in the warehouse. Conference Rooms – Prefabricated conference rooms provide the perfect space for meetings and round table discussions. Accessories such as projection screens, cork or dry erase boards, and integrated audio-visual equipment makes a prefabricated conference room a perfect place to brainstorm and collaborate. Lunch or Break Rooms – Lunch or Break Rooms offer employees somewhere to sit down and enjoy their lunch or break. Providing a clean lunchroom and a space for employees to take a breather during their workday boosts productivity. Portable Offices – If you want the flexibility of having office space you can move, portable offices are a great solution. These transportable offices can get customized with a variety of features, including HVAC for temperature control. Our company specializes in building modular offices that help our clients maximize floor space and cut costs and downtime associated with traditional construction. As a modular solution, it is a quick and easy solution that fits within your existing infrastructure! The amount of time, effort, and mess that is created when performing traditional construction activities is gone when you go with a modular solution. As you can imagine, this benefit alone saves your company thousands of dollars in renovation costs. Plus, if the configuration of your operations floor changes, prefabricated offices are moveable. When you need to change their location, you don’t need to make permanent changes to your facilities to do so. Assembly of our prefabricated offices is easy. Made of durable and lightweight materials, these offices can get put together within a short period, exactly where you want them to stand. If you’re unsure of what solutions are right for your building, get in touch with us today. Our modular office specialists are happy to discuss your project and offer guidance on what modular solutions would work best for you. Contact us and we can design a mezzanine or modular office to fit and improve your workspace.